If 2018 remained stable, the market seems to be showing signs of weakness at the beginning of 2019. During the first quarter (from January 1 to March 25) we collected prices for some 418 horses sold, compared to 655 at the same time last year, which represents a dramatic volume reduction of 36%. However, some sales are still doing very well, such as the sale of embryos held in Sharjah, UAE, which saw an increase in the number sold and the average price. 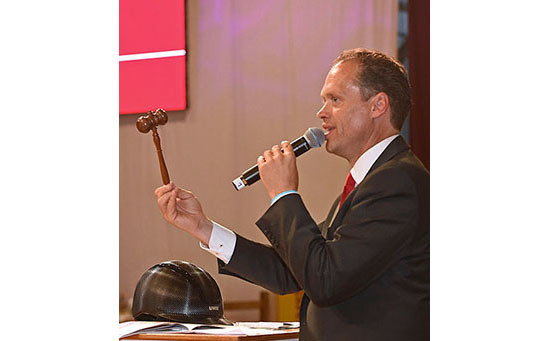 A new embryo auction was organised for the first time by ARQANA, which took place during Asia Horse Week. With a good collection of equine embryos, the sale was organised in Hong Kong and bids were also taken online and at the sales company’s headquarters in Deauville, France. The opening lot by Eldorado Van De Zeshoek (out of Coriana Van Klapscheut x Darco), who competed with Pilar Cordon and Eric Lamaze, sold for €41,000 online to a Canadian buyer. This was the highest-priced embryo of the entire sale. With a turnover of more than €1.5 million, the sale organized by VDL during Wellington’s Winter Equestrian Festival in Florida remained successful, even though it showed a decline compared to 2018 when four additional horses were sold which pushed the total to over €2.1 million. This year, 13 VDL sport horses found new owners, with the auction’s top seller being the six-year-old gelding VDL Ibiza (Inshallah de Muze - Watch Me B x Indoctro), who sold for $335,000. The buyer was Lothlorien farm, who also purchased two other horses: VDL Jasper (Falaise de Muze - Fleur x Emilion) and VDL Imar (Carrera VDL - Dumara x Indoctro). This auction achieved an important average sales price of $144,000. If the WEF sale saw one of the best results of the first quarter of 2019, it was a German auction that celebrated the highest price. 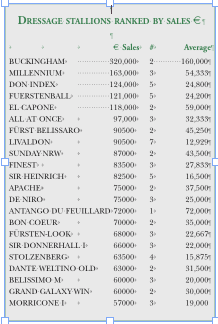 During the auction of the German Sport Horse (DSP) körung in Munich at the end of January, a fast-moving and top-selling premium stallion by Buckingham, out of a Sir Donnerhall dam, was the measure of all things when the hammer fell at €300,000 to a buyer who preferred to remain anonymous. The most expensive jumping stallions with €100,000 apiece were a son of Calido I, out of a Cristo dam, bred by Josef Weisshaupt from Jettingen, and a son of Diamant de Semilly x Cassini I, bred by the Wilbers-Stücker stallion station in Weeze. A strong-moving dressage stallion and a winning son of Millennium x San Amour, bred by Bernhard Schumm in Crailsheim, has moved for €100,000 into the hands of Sissy Max-Theurer. Gestüt Sprehe also acquired prospective stallions as elite foals during the auction in Nördlingen.